my friend Lauren Murphy. I am SO GRATEFUL for her. Sometimes, the hardest thing to do when you're single is to be happy for a friend who just met "the One". What is between you and genuine happiness for them? To find out, it's likely going to take some tools. My sister-friend Lauren shares her toolkit and lots of her wisdom nuggets....like the idea that texting is for the ego, connecting in person is for the spirit, and another gem...dating requires giving the guy a break. Make a cup of tea and join us! Are you angry that you're still single? Could it be that a fear of vulnerability is keeping you from finding love? 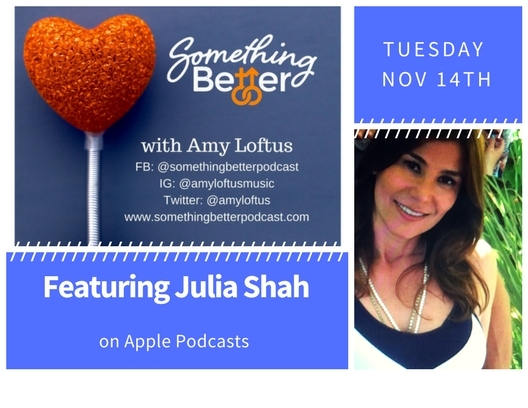 Psychologist and master matchmaker Julia Shah and I discuss the perils of knowing yourself and your inner limits without leaving the light on for vulnerable, intimate space for yourself and others. I myself am feeling vulnerable as I write this. I am about to get on a plane to my father's funeral. I am feeling small, for all the times I was sitting and working on this podcast, since the spring, and skipping the short available windows around my Dad's naptimes to call him. I wanted to keep working. Suddenly that feels so small and hollow. This would have been there when I got back. I also know that often times, I did call. And he was so wonderful, and so supportive of my endeavors. Among his repertoire: "Bravo, well done, good for you, the best is yet to come, that sounds great, Aim!" My Dad was very prosperous with his language. He did not like swears, even flinched if you said "I swear, I will" or something like that. He consciously used language. "Thank you," "Good" and appreciation was always on the tip of his tongue with every caregiver right til the end of his 83 years. I kept this in mind when I made this a PG podcast. My relationship with my Dad was important to me. It was messy at times, but it was honest. I treasure him, I am grateful for his influence, and the incredible opportunity to have been with him when he passed away, and to have spent the last afternoon of his life singing to him. My mission in all these adventures through music and writing and doing this podcast is the same. To help people feel. I am proud of this episode because I believe it contains permission to do just that. To let yourself feel your emotions, whatever they are. I think you can trust that this week, I am no doubt attending my own lecture.